Village Brave is a game intended for the two-week Game Gale contest that happened to take a little longer, although Kentona insists that only two-week’s worth of development time was actually spent on it. Couple this short dev-time with the fact that this is Kentona’s first project using RPGMaker VX and you’ve got a combination of circumstances that should result in lowered expectations. However, having played and enjoyed (and reviewed) Kentona’s previous short-dev time project, Generica, my expectations weren’t lowered one bit and I opened this game with a lot of optimism. Why optimism? Because sometimes, when a project tries to do too much or tries to be too innovative, it is easy for the developer to forget that the game has to be fun as well, but what Kentona does as a developer is create games that are entertaining without ever trying to break the mould. I don’t mean this in a derogatory way, although it would be easy to say that this is a bad thing if you’re the kind of developer who prefers pushing the boundaries or the kind of player who relishes new experiences, because I love being able to pick up a game without needing to read reams of tutorials and backstory to enjoy it. Kentona’s games are generally very “pick-up-and-play” and this is definitely a good thing. The problem with this sort of approach to game design is that, although you very rarely hit low-points, you’re never going to hit the high-points. You’re not going to give players the sensation of a new gaming experience; you’re not going to bend their emotions with your storyline or characterisation and; you’re not going to hook them with new puzzles or minigames. In most cases, this doesn’t really hurt Kentona’s games because they’re still varied enough to pull off the generic role-playing experience without getting tedious. It also doesn't hurt Kentona's games because he generally produces gameplay that is a perfect facsimile of the role-playing gameplay you used to love on your SNES or Mega-Drive. Unfortunately, neither of these is true of Village Brave. First of all, Village Brave doesn't manage to have area-map gameplay that is engaging and rewarding, something that I certainly didn't expect from a Kentona game! You will press the up key more in this game than you are likely to in any other because you are only ever moving in one direction. This gets fairly tedious. More tedious are sequences like the "cracks in the floor" segment, where stepping on certain tiles will make you fall down into a cave below you. This mechanic is cool if you use it to hide items or if you use it as a puzzle, but to have a whole area littered with invisible "fall" events that the player has to trial-and-error their way past is silly. It artificially extends the playtime, it is really boring and it is really, really unimaginative. Another problem with the area-map gameplay is that, although there are a lot of things you can loot (I think everything in the opening village is searchable, you can loot campsites and everything from logs to rocks are searchable), the maps never really force you to look for these events; they are absolutely everywhere. This works for "mix" items like flint and wood because you need them in high supply (and you would expect things like flint and wood to be everywhere), but it doesn't work for equipment and weapons because such items should make you feel "rewarded" when you find them. Equally, they should be used as bait to get you searching around the map but, because the maps are so linear, there isn't any where they could be placed that would get you searching. By having equipment and items in random piles of wood and rock that are basically everywhere, you remove this mechanic for rewarding people and make your maps even more boring than their linearity is. Battles are another area that are lacking in this game. The most prominent problem is that the skills your characters learn are basic, lack variety and are far too easy to spam over and over. 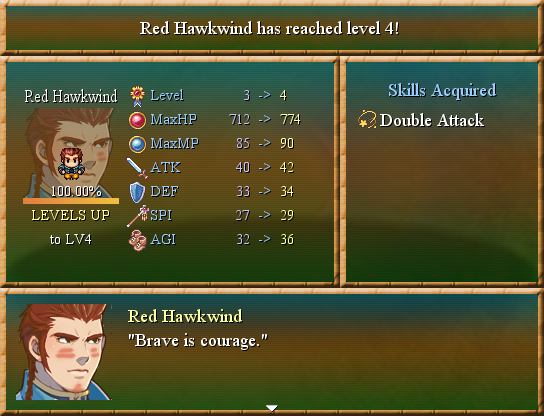 For instance, both Babby and Red Hawkwind have multi-hit skills that they can use - why do they both need one? And why does Red Hawkwind need one when his "rage" move (basically a limit-break) is supposed to be one? Even the “mix”-style skill that the main character has fails to spice things up because there are so few combinations available and because one of them, “Magic Wand”, is ridiculously more useful than the others. Couple these problems with the fact that the enemies in Village Brave are not very varied (nor very difficult to defeat) and you end up with a rather mediocre combat system. The battles were far from terrible (I have definitely seen worse) but, because there wasn’t anything on the area-map backing the battles up, they got boring. Wow, two attacks in one turn! But... isn't that supposed to be my "limit break" as well!? For instance, getting a baby to write the dialogue for a character no one is supposed to understand (bar the main character) is a clever touch and, as a result, the dialogue for Babby is pretty funny throughout. In fact, the dialogue throughout is pretty strong because the way the characters talk suits the native American setting really well. Like another reviewer pointed out, things like "sister boy-child" do just enough to distinguish the setting from what we’re used to in traditional role-playing games (that being a fantasy-medieval setting) and this is definitely a good thing! To be honest, seeing something that isn’t based around a fantasy-medieval or sci-fi setting is always nice regardless of how well it is executed; that it is so well done is just the icing on the cake. Another impressive part of the game were the various riddles used thoughout. The riddles aren't overly difficult (which riddles always have the potential to be) and I had just enough trouble with them that they were entertaining. However, this is definitely a "your milage will vary" situation - if you're not a big fan of riddles then you're going to hate these segments no matter what and there isn't much Kentona can do about that (although, I suppose, you could always look for the answers on the internet).